So, this post has been rather difficult to write…my left hand is excessively wrapped in gauze protecting my most recent injury. Let’s start at the beginning…the date was November 16. The year? 2011. The cat got out of the bag at work about my t-shirt making hobby. (I use iron-ons…and yeah, I’m a real dork.) One of my coworkers asked me if I could make one for her. Now, I take t-shirt design very seriously, folks, so making one can be a very time consuming project. Because, yeah, here are some examples. Thing is, this t-shirt project should have been really easy. My coworker even sent me the graphic she wanted me to use. It can take a lot of energy (because I’m crazy) to get the design situated perfectly on the t-shirt, but usually the hardest part is getting the design perfect. This time, the design came ready-to-go (AND, my coworker gave me the t-shirt she wanted me to use, eliminating a whole ‘nother level of potential drama), so what the heck was my problem? Honestly? I’m not even sure. A few things: 1. I knew I was running out of ink. 2. I knew some of the ink was expired. 3. I had forgotten which transfer paper worked the best. 4. My printer was SO hidden under piles of crap. 5. I hate imperfection. Be that as it may…3.5 years to make a t-shirt is pretty ridiculous. Unfinished projects loom over me, killing me a little each day. Okay, maybe that’s a little dramatic, but they really do bug the crap out of me. Anyway, I recently bought brand new ink and printed off another design for a friend. I decided it was time to crap or get off the pot. 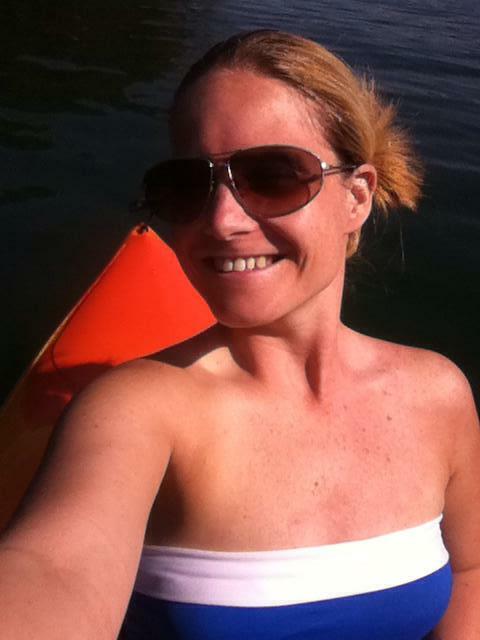 I mean, I felt guilty every single time I saw this coworker, like I had somehow failed her. So, I printed off the design (after resending it to myself because I couldn’t find it anywhere). That was weeks (or at least days) ago. This Saturday I decided it was time. I had the house to myself, so I set up shop. I followed the directions on the iron-on package explicitly. I put a pillowcase down on the counter, taped it in place, ironed it and proceeded to position the t-shirt. I centered the t-shirt the best I could and then taped that down as well. I started ironing the t-shirt, focusing mainly on the area where I was going to put the design. Then I noticed the sleeves were a little wrinkled, so I focused on them a little bit. I couldn’t quite position myself correctly, to get all the wrinkles out without creating permanent wrinkles in places that should have just been left alone. And here’s where the climax should be…except that I’m not entirely sure what happened next because I wasn’t paying full attention. I went to put the iron down, to reassess the positioning of the sleeves. It’s not that I was going to put the hot part of the iron down on the counter…because I wasn’t. Regardless, I put the hot part of the iron down on my hand. 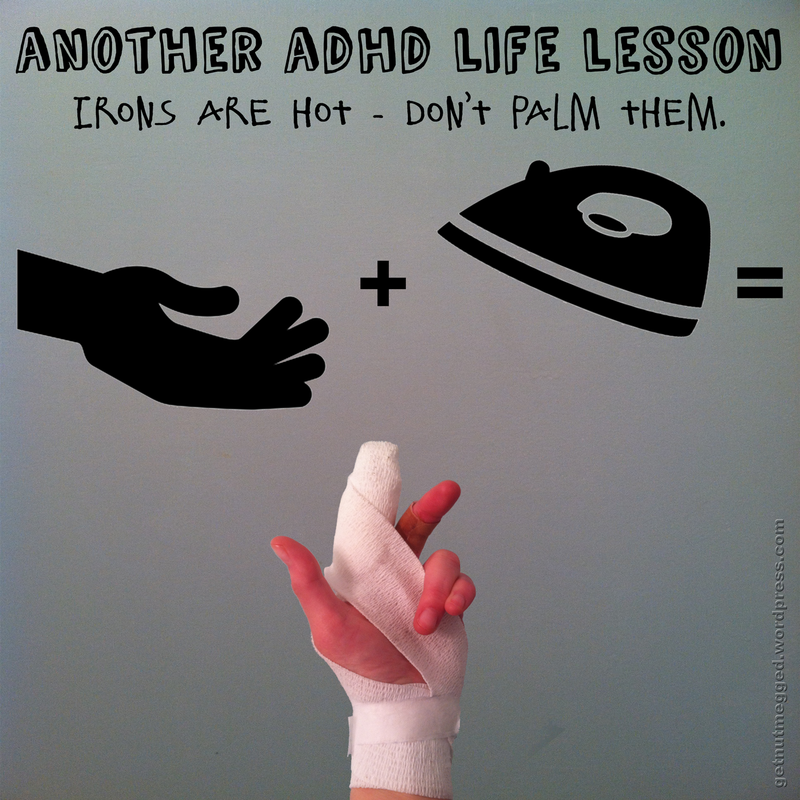 But you know, Another ADHD Life Lesson learned: Irons are hot – don’t palm them. I know all too well about accidents myself. Heh. Sounds so typical. I can’t tell you how many times I’ve sliced myself with the rotary cutter over the years because I forget that the blade is still razor sharp at the top and I can’t just roll it under the hand that’s holding the fabric. And my house, too, is the land of unfinished projects! Yeah, it’s almost like you know you can’t pay attention, so you over pay attention to the one thing, trying to be careful, and end up hurting yourself anyway. Unfinished projects are such life-suckers, aren’t they? Ick. I hate ’em! Especially when you have to clean them up before you start the next project you’re probably not going to finish! Yup! Oh, the piles on piles…on secret stashes…of unfinished projects. Such chaos! Why can’t they just finish themselves? Or at least clean up after themselves? I’ve been trying to teach the cats to do it, but they’ll have none of that.